Accurately forecasting cost, completion and revenue all hinges on a solid, reliable project schedule. Fuse produces clear and concise reports so analysis and performance can easily be reported to contractors along with to-do lists of any needed improvements. Fuse reporting is designed to be hierarchical so that it accommodates planners, schedulers and executive’s needs. You can drill down, slicing and dicing through multiple levels (Work Breakdown) or by any other code or user field to quickly pinpoint potential issues with your schedule. Conversely, summarise detailed results and publish to project dashboards, executive briefings and PowerPoint presentations, all at the click of a button. 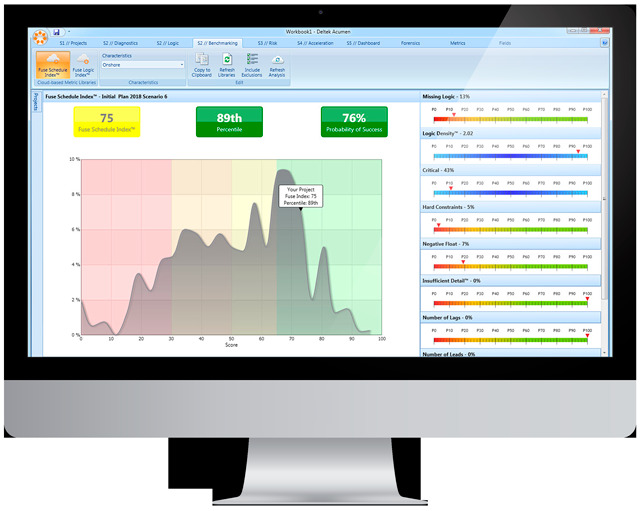 • Give you a repeatable way to score and critique schedule quality, pinpoint weaknesses, evaluate performance during execution and gauge the impact of changes. • Fuse provides project intelligence through advanced analytics, which gives you unique insight into how to improve project plans and execution – which ultimately leads to a competitive advantage out in the marketplace. Create schedules that give you a better score against best industry practices. The Fuse schedule cleanser removes constraints and redundancies to save money.